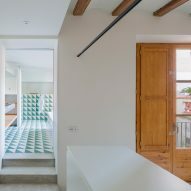 Colourful restored tile flooring and wooden ceiling beams add character to this Barcelona apartment refurbished by local studio Nook Architects. 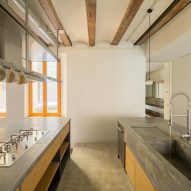 Completed this year, the 273-square-metre apartment occupies an entire floor of a building in the city's Raval quarter, just a few metres from La Rambla. 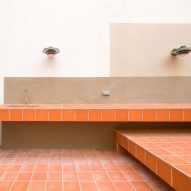 While the apartment's front facade looks out across Boqueria market, a stepped 68-square-metre terrace sits at the rear. 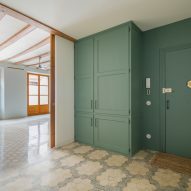 While removing the apartment's "small obsolete rooms" and inserting glass partitions to create a more open layout, Nook Architects took care to preserve the apartment's original features. From the outset, the client – a translator and writer – stipulated that she needed the apartment to function as a work space, as well as a place to host friends and family. The Barcelona-based architects explained: "With this strong focus on versatility, she wanted the uses of different rooms to be interchangeable so as not to create any sort of spatial hierarchy." Entered off a central stairwell, a pathway circles the perimeter of the apartment connecting each of its rooms, which can be separated off by large sliding doors that disappear into the walls. Glass panel walls and doors with timber and metal frames allow light to flow through the rooms even when doors are shut. "We opted for a form of room division that is lightweight, transparent and practical," said the architects. "As a result, areas could be isolated from one another, yet remain visible." 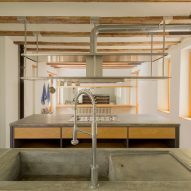 Spanning the entire width of the apartment, the kitchen sits at the centre of the plan, linking to all other areas in the apartment through its four doorways. Windows that look into a central lightwell provide daylight in the kitchen, bathroom, laundry and storage rooms. Sandwiched by two Crittal glass screens, the master bedroom with its adjoining bathroom, wardrobe and office functions as a "flat within a flat" said the architects. If needed, the office space can also be used as a second bedroom, satisfying the client's need for flexibility. Floating shelves that mimic the apartment's original exposed beams were incorporated into the design to provide storage space for the client's sizable book collection – hence the project title, The Bookcase. "We transformed the apartment into one great bookcase, using large wooden shelves to accommodate the client's collection of more than four thousand books," explained the architects. 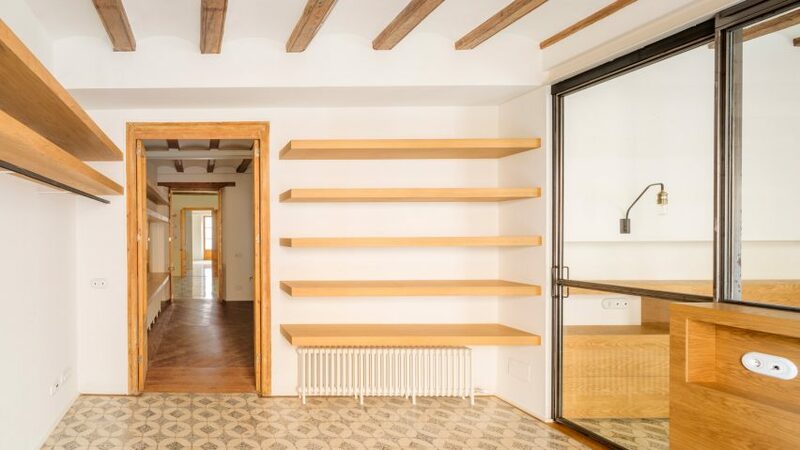 "We integrated the shelving with the existing wooden beams so as to give a sense of linearity and achieve continuity from one side of the room to the other. The same lineal aesthetic was applied to other elements in the apartment, such as the bathrooms, kitchen and clothes storage." 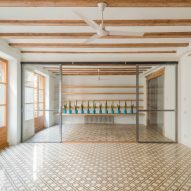 As well as uncovering the apartment's original beams, the Barcelona-based architects were able to recondition the original roofing blocks, floor tiles and joinery. 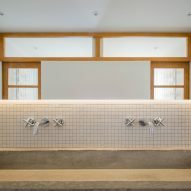 New materials, including wood shelving, steel room dividers, and concrete worktops, sinks and flooring, were selected to complement the building's original surfaces. On the terrace, the architects focused on restoring the original elements, such as the balustrades and existing ceramic tiles. Here, the layout was reconfigured to create overlapping sections on different levels. 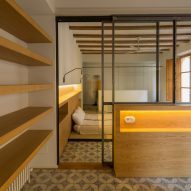 Led by architects Ana García, Joan G Cortés and Rubén F Berenguer, Nook Architects primarily works on refurbishment projects in Barcelona's historic buildings. 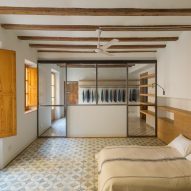 The studio – which ranked at number 90 on the inaugural Dezeen Hot List – also recently completed a bed and breakfast featuring vibrant blue tiles and cobalt-hued paintwork, and a flat where mirrors create the illusion of extra space.